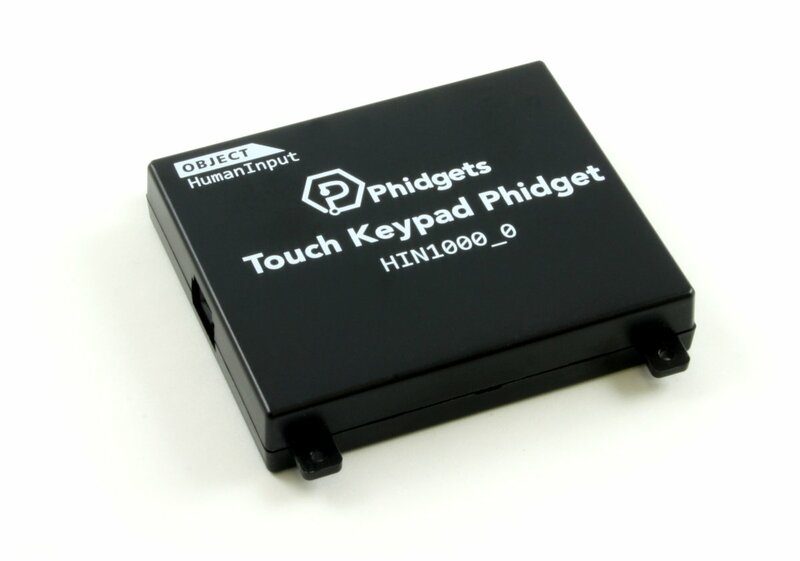 For a seamless user input solution that differs from the ordinary pushbutton, try the Touch Keypad Phidget. It works like a smartphone's touchscreen, sensing the change in capacitance as you finger comes near. As such, you can place the Touch Keypad Phidget behind up to 3mm of glass or plastic, allowing you to enclose the hardware to make the panel child-friendly and aesthetically pleasing. The HIN1000 connects to a port on a VINT Hub. See the Connection & Compatibility tab for a list of hubs. Connect the HIN1000 to the VINT Hub using the Phidget cable. 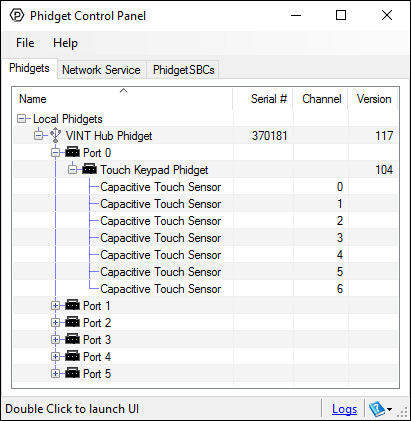 In order to demonstrate the functionality of the HIN1000, the Phidget Control Panel running on a Windows machine will be used. Linux users can follow the getting started with Linux guide and continue reading here for more information about the HIN1000. When you double click on a Capacitive Touch object, a window like the one pictured will open. On the left, change trigger and/or data interval can be changed. 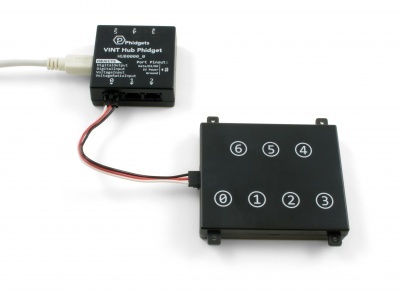 For more information on these settings, see the Data Rate/Change Trigger page. In addition, the sensor's sensitivity can be adjusted. The higher the sensitivity, the more susceptible the sensor will be to sensing touch. On the right, the Touch? 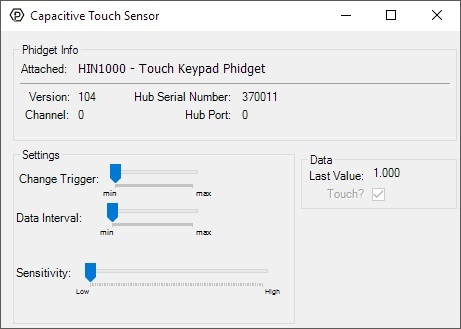 check box will be checked if an object is touching or nearly touching the surface associated with this capacitive touch object. 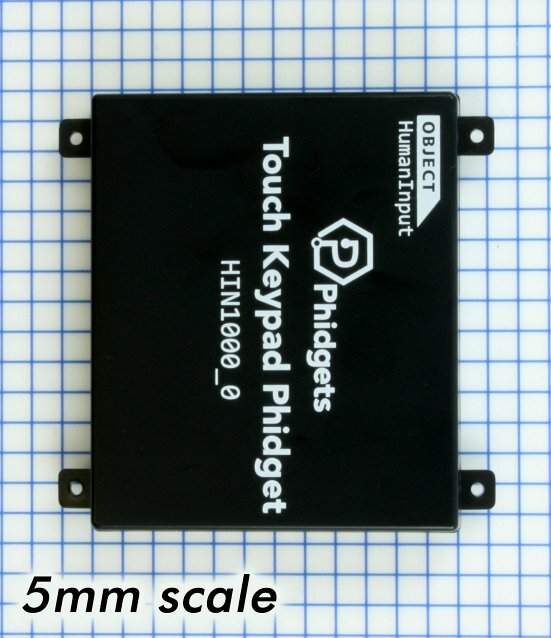 For capacitive touch objects that have a linear or circular touch region, the Last Value corresponds to the location on the region that the current or most recent touch occurred. Since capacitive touch sensors rely on checking capacitance against a threshold to detect when they are touched, they need to keep a good baseline of the capacitance of their environment. The HIN1000 will re-calibrate its baseline levels if it detects a constant touch for more than 60 seconds, in order to prevent getting stuck in a touched state. Similarly, it will re-calibrate its baseline capacitance to adjust to falling capacitance (such as when it is moved away from a surface) in order to prevent getting stuck in a not-touched state. The latter adjustment happens soon after the baseline is detected to have fallen.